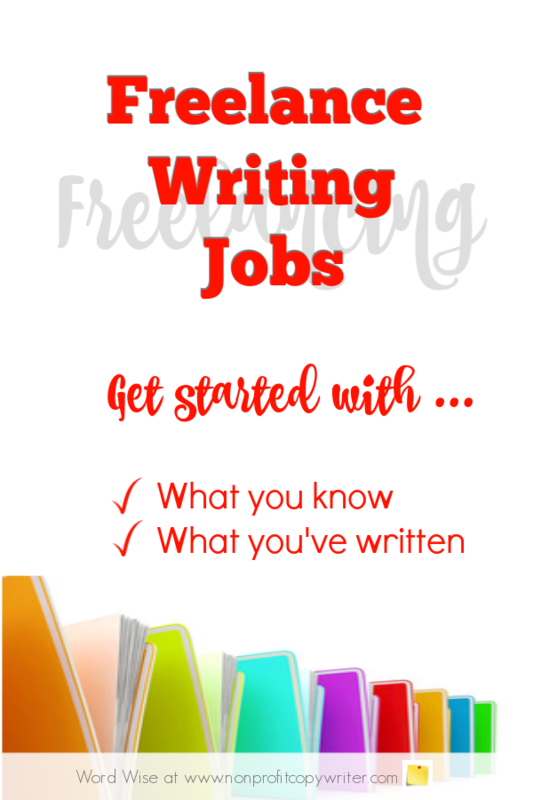 Snagging freelance writing jobs for beginners is a multi-step process. But don’t be overwhelmed and don’t get discouraged. There is a need for freelance writers in nonprofits, ministries, and small businesses. You can take one step at a time to help meet that need. In this site I share those steps with you one by one, which include acquiring basic writing skills and putting together a sample writing portfolio. For now, take the time to understand that freelancers can be hired for all kinds of writing jobs. That’s why when it comes to getting your first freelance writing assignments, you need to narrow down your niche so you know to whom to market your services. What you know: what subjects come easiest to you or are you most familiar with? What you’ve written: which kinds of projects have you written before? You’ve probably heard the mantra: “Write what you know.” The best place to start getting assignments is by seeking out freelance writing projects in one of your areas of expertise. These subjects are the most familiar to you. You have experience with them and you may even have related clips. You know what kind of background you need to generate the content. Writing about these topics gives you confidence. Once I’d made up my mind I wanted to become a freelance writer and enrolled in a copywriting course, one of my first writing assignments was writing a promotion letter for a nutritional supplement. I was utterly overwhelmed. I hadn’t taken a science class since high school and now, 25 years later, had to bone up on how proteins and molecules work before I could even begin to write about how the product was enticing to the reader. Did I mention that I was utterly overwhelmed? I spent a lot of time on the phone with my RN friend who gave me a crash course in nutrition. Contrast that to an earlier assignment – a personal experience article. I wrote about how I regularly shopped for Christmas gifts all year long, which saved me hundreds of dollars and eased stress each December. The article targeted busy moms. I conducted some extra research to bolster my argument with statistics and add credibility from other shoppers, but the topic was right up my alley. Subjects that are familiar to you require less research to get up to speed. If you have experience as a chef (culinary arts) or in rappelling (adventure sports) or a degree in biology (science and health care), then consider targeting your first freelance writing assignments in those areas. Bob Bly’s college degree is in engineering. His first job was as a junior staff writer with a defense contractor, where he helped produce industry content for its airport radar systems – press releases, brochures, slide presentations. Soon he moved on to a position as an advertising manager for a technical manufacturer. Fast forward a couple of years. By then Bob had taken courses in copywriting so when his employer wanted to transfer him, Bob decided to resign and go out on his own as a freelancer. But now he had some contacts and clips – and a good bit of know-how when it came to technical writing and business-to-business (B2B) writing. He leveraged that experience to get his first freelance writing projects. What kinds of projects have you already written? Maybe you have several articles in your portfolio. Or perhaps you edited a newsletter at work or for your church or created a grant application for your daughter’s PTA. Maybe you’ve been a teacher or trainer and have put down on paper lessons or course outlines or teaching materials. Perhaps you have a blog. Or maybe you’re simply good at creating pithy social media posts. “Yes, I’ve written articles. Yes, I’ve written cover letters. Yes, I’ve written resumes. Yes, I’ve created PowerPoint presentations.” When you're looking for your first assignments (freelance writing jobs for beginners) consider targeting your first paying assignments by building upon your first set of clips – those pieces you’ve already produced, even if in another venue. You have experience. Leverage it. Paying clients are out there who need your skills – the skills you have already started to build. Start with what you know and what you’ve written already. And go from there. Should You Specialize in a Freelance Content Writing Niche?